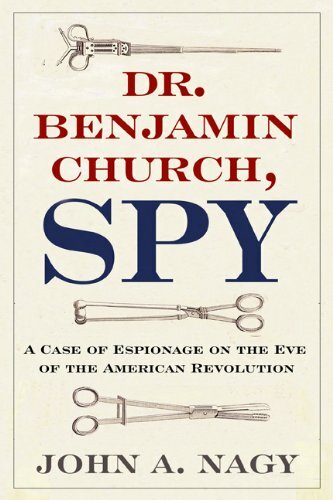 Dr. Benjamin Church was an early Boston Patriot. Church played a large role in igniting the American Revolution and was placed in charge of both the Medical and Hospital Departments of the Continental Army. Oh, then he committed treason. The political leanings of Dr. Benjamin Church had always been in question. In the lead-up to the American Revolution, Church was called a fiery Patriot by some and a British sympathizer by others. Either way, he established himself as a leader of the resistance in Boston. Dr. Church gave the third annual speech in commemoration of the Boston Massacre, guiding the people toward revolution. Church received election to the Massachusetts Provincial Congress and, later, was made a member of the Committee of Safety. The Committee of Safety would soon take over as the wartime government of the colony. As conflict neared, Church was paired up with Joseph Warren to determine the militia's need for medical supplies. He was also part of a team whose responsibility it was to recruit and train military surgeons. Benjamin additionally assisted with the war itself, helping to strategize the fortification of Bunker Hill. He then went to Philadelphia, where he spoke with the Continental Congress about the best ways to defend Massachusetts and take Boston back from the Redcoats. Upon his return, Church was one of the men who officially welcomed General Washington when he arrived to take control of the Continental Army from Artemas Ward. Dr. Benjamin Church was awarded for his efforts when he was appointed as both the First Director General of the Medical Department and Chief Physician of the Hospital Department. Basically, if it involved medicine in the Revolutionary War, Church was in charge. Then, his correspondence was intercepted. Dr. Church had a mistress. Apparently, he trusted this mistress to communicate treasonous information to General Gage, Military Governor of Boston. Fortunately, she was a Patriot. This mistress gave Benjamin's letter to another lover, who eventually communicated it to Washington. A court martial was held. Church claimed he was attempting to scare the British by inflating the number of Continental soldiers. We know now, thanks to the release of Gage’s papers a century later, this was not true. Church was a spy, a traitor. Washington left Benjamin's punishment up to the Continental Congress who sentenced him to prison. He was eventually paroled but found himself a target of the Massachusetts Banishment Act. Dr. Church set sail for the Caribbean, but his ship was lost at see. A fittingly mysterious end to the life of a Loyalist spy. If you are interested in learning more about Dr. Church, 'Spy' by John A. Nagy far exceeds any other available. Not only does it give an informative account of the not-so-good doctor's life, but, personally, I found the way this story reflects on the early days of the American Revolution extremely interesting. Pick it up at the library or (if you want to support this site) through our Amazon affiliate link below. There is also a really cool blog I found which is dedicated specifically to the life of Dr. Church which I recommend you can find here. Also, this is the part where I recommend you subscribe to our email list so you can receive fun articles like this every single morning. Do that here.